Ambiance is a 52ft motor yacht perfect for boat charters Sydney, newly refitted both inside and out, and so presents very well. It has a high aft deck – great for taking in the sights of Sydney Harbour. Uniquely, it also has a lower aft cockpit for easy assess to water and swimming. There is very large saloon for comfortable dining and relaxing. Outside, plenty of space around the decks including a large for-deck. 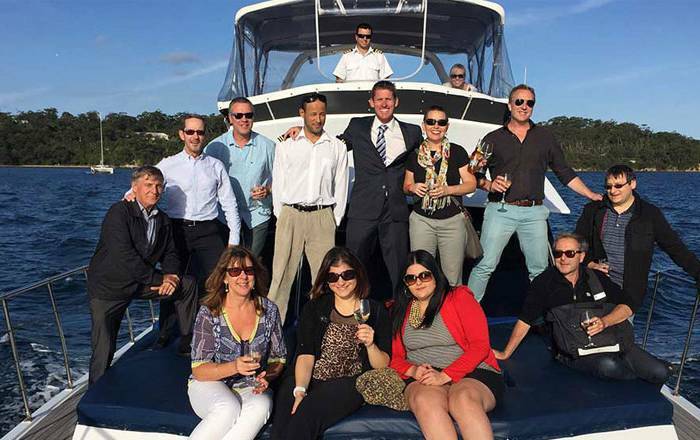 Spoil yourself to Sydney Harbour’s sensational lunch and twilight cruises. This Vessel also runs lunch time (1230) and evening (500pm) Harbour Tours. Departs from Campbell’s Cove Pontoon, Circular Quay. This is a floating pontoon located between the Overseas Passenger Terminal and the Park Hyatt. Your personal captain & host will share the rich history of Sydney Harbour and its foreshore as you take in the sites of the Sydney Harbour Bridge, the Sydney Opera House and the bays and coves of Sydney Harbour. Enjoy a gourmet 3 course BBQ lunch with regional wines, local beers and 5-star service. Immerse yourself in all the activities that a private vessel offers including, swimming, fishing and kayaking – or sit back, relax on the expansive sunbed and do nothing at all.